The only way that I can begin to describe this book accurately is with an excerpt. This is just one of many similar accounts I could have chosen. Ishmael Beah was 13 years old when this story happened. 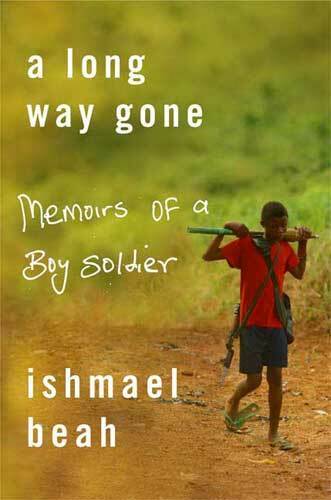 A Long Way Gone tells the story of Ishmael from the ages of 12 through 16. He is forced into the government’s army in Sierra Leone, and is subsequently brainwashed into fighting against the rebel RUF armies. His days are filled with fighting, sniffing brown-brown (cocaine mixed with gunpowder), and watching Rambo on repeat. Beah ultimately earns a distinction as one of the most notorious child soldiers in Sierra Leone, before he is taken into custody by Unicef who begins the long process of rehabilitating a child who has literally murdered hundreds of people. This book should be a must read for everybody — it gives a horrifying glimpse of another reality of Sierra Leone aside from the more publicized blood diamonds.